George Taylor is one of several oil train protestors who refer to themselves as the "Climate Defenders." The reverend believed he had no choice. Now he'll make his case to the jury. Rev. 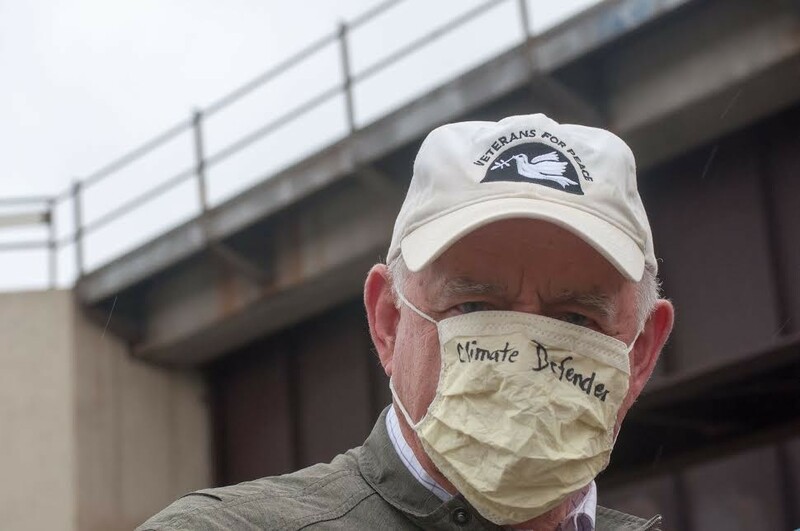 George Taylor stood on railway tracks in September 2016 to protest what he believes to be insidious coal and oil trains rumbling through downtown Spokane, and their contribution to global climate change. Taylor, a spry 77-year-old, knew he was breaking the law. And that's the point. He's currently facing misdemeanor charges of trespassing and obstructing or delaying a train. In court, he explained to the judge that the other ways in which he's attempted to halt the flow of coal and oil — lobbying, attending public hearings, writing to legislators, protesting — have thus far been unsuccessful. Taylor argued that he, and the other senior citizen activists arrested on train tracks last year, were left with no choice but to break the law. His co-defendants have taken plea deals. But in order for Taylor to present his argument — known as the necessity defense — to a jury, he needed a judge's permission. Following testimony from Taylor and experts including a climate change scientist, Spokane County District Court Judge Debra Hayes will allow the uncommon legal defense to go to a jury. "The ultimate goal would be to keep those fossil fuels in the ground in Wyoming and Montana where they're not going to do any damage to anybody," Taylor said during a June interview. "So that would be my goal. But this is an attempt to bring to the public the urgency of this problem." Taylor's attorney, Rachael Osborn, called Hayes' ruling "fitting for these unusual times." She notes that a judge in a Minnesota court also recently approved a necessity defense for climate change activists. "Climate change is a huge problem, and we can see it right here in the Inland Northwest," she says. "The judge listened carefully and understood there is potentially a greater harm here and it is appropriate for a jury to hear." One of the experts who testified on Taylor's behalf, Dr. Steven Running, a professor at the University of Montana and a NASA scientist, laid out the human impact on climate change. "This exhibit shows that the carbon dioxide in the atmosphere is, in fact, going up," Running said in court. 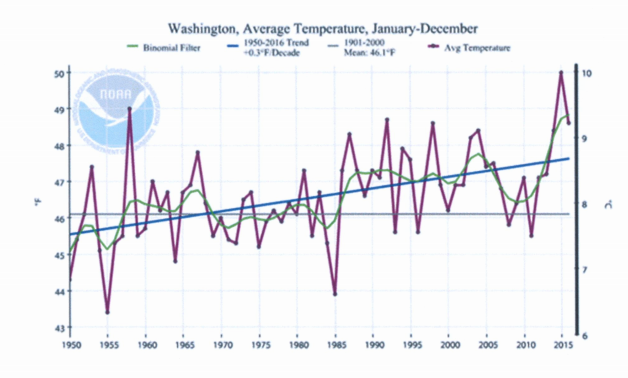 "It has gone up every single year since Charles David Keeling began the measurements in 1958. And so it's been considered the most important geophysical dataset of the century because it was our first illustration that humans were having a global impact." 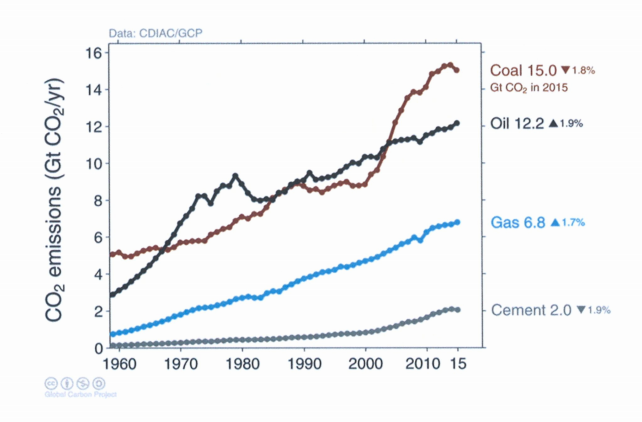 "This graph illustrates that by far, the largest single source of CO2 emissions is burning coal," Running said. "The second largest source is burning oil. The third largest source is burning natural gas. 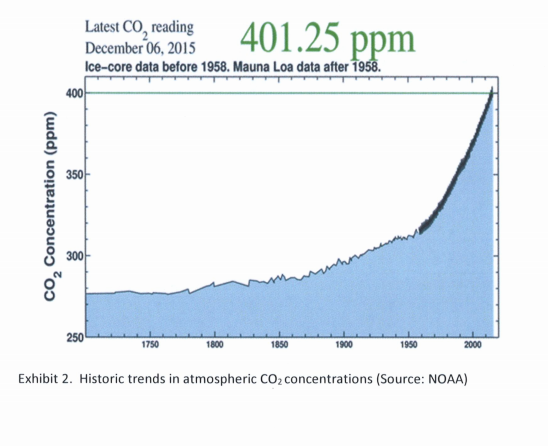 And that each of these emission sources on a global basis is increasing." "This shows, again, a temperature increase of about three-tenths of a degree Fahrenheit for [each] decade since 1950," Running said. "So the same sort of trend seen globally is also seen here in Washington." "I think all of us that live around here know that our snowpack is what carries our hydrology through our dry summers," Running said. 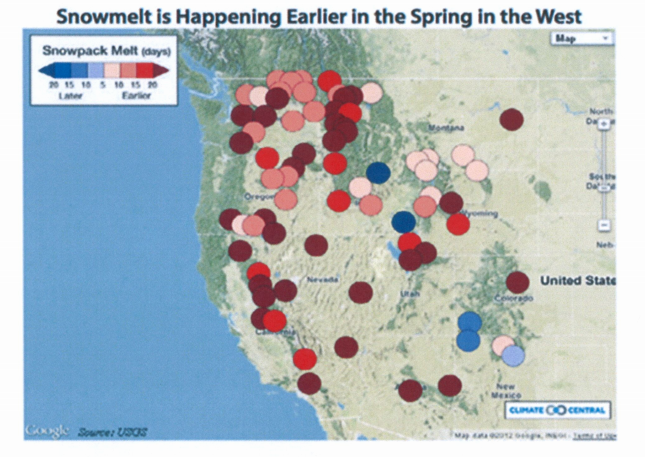 "And so we have followed snowmelt rates very carefully for decades. This graph I chose is a summary of what we're seeing all around the west, that of the last 50 years, snow pack is starting to melt earlier and earlier, and on average ... it's about two weeks earlier than it was in the 1950s." "[The] highest human vulnerability for the Northwest outside the coastal areas is accelerating wildfire," Running said. 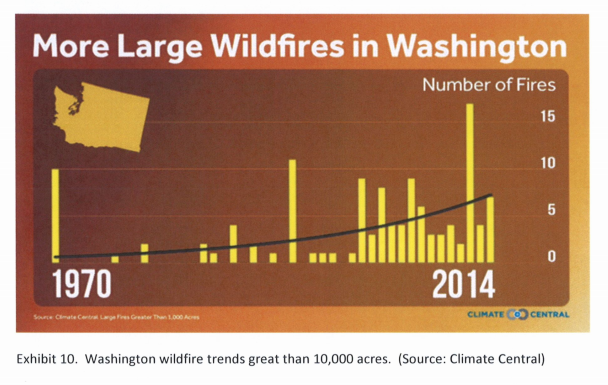 "And this graph shows that the number of large wildfires has accelerated dramatically. This is only for Washington. We do this same analysis for the Western United States as a whole, and we see every way we slice and dice the statistics, we're seeing three and four and five times as many large wildfires as we did 40-50 years ago."